When I was young I was a big fan of My Little Ponies. The original drawn series and the figures alike. 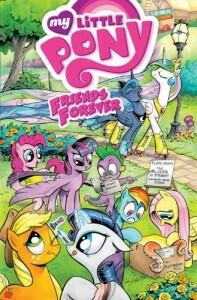 I was glad the franchise was revived with My Little Pony: Friendship is Magic several years later. This comic book tells four short stories, and it reads just like watching an episode of the series, so if you've enjoyed those, you'll probably enjoy this book as well. For me, it was also a trip down memory lane, so I really liked reading it.